Green Wood Creations is a new green woodworking enterprise, with roots working with locally sourced green wood, using traditional tools and techniques to produce a range of unique hand crafted products. These range from traditionally made chairs, rustic furniture, fencing and other green wood garden products, turned items, timber frames, coppice products and other woodland crafts. 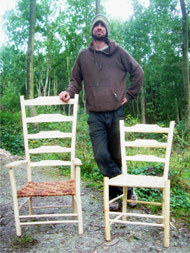 Green Wood Creations has developed from an aspiration to follow a low impact, land based lifestyle. The products I produce are mainly dependent and inspired from the materials available at the time, which generally come from woodlands that I have been managing, or from other local woodlands or outlets.